I walked the Race for the Cure 5k yesterday and it was absolutely incredible. It was a really emotional event, and I had to fight back tears a few times. First, because there were so many people there rallying for a cause that has affected them personally. 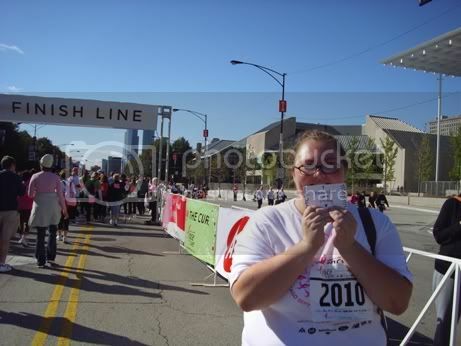 And also because, for the first time in my life, I crossed a finish line. I can usually walk a mile in about 15 minutes, but since I was walking with my friend and we were chatting the whole time, we finished the 3.1 miles in a little under an hour. And I'm perfectly okay with that. My recipe for this week wasn't so much a recipe as a fancy marinade and a new food I've never tried before. A grocery store in my hometown just got bought out by another company so anything that had the old company's price stickers on it got sold at a reduced price. 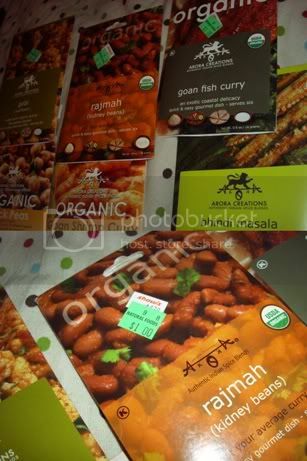 My mom bought up a bunch of organic Indian spice packets - usually $5 each, on clearance for $1. Awesome job, Mom! So, I made the goan fish curry and served it with lentils. The marinade was made with lemon juice, olive oil, and the spice packet - which contained organic paprika, cumin, coriander, garlic, ginger, chilies, onion, black pepper, turmeric, nutmeg, and mace. 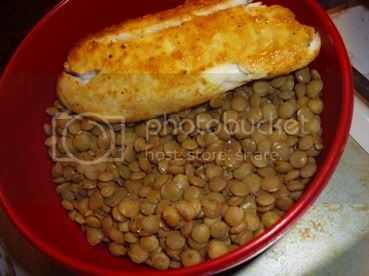 I only made 1/3 of the marinade and put the rest of the spice packet in with the cooking lentils, which gave them a subtle spiciness. The marinade was delicious - spicy but citrus-y, and not too much of either. The problem came with my choice of fish. I grew up on the East Coast and I'm not sure we ever bought fish - my dad would go on chartered deep sea fishing trips with some of the doctors he worked with, and he'd bring home a thirty to forty pound striped bass that they cleaned and cut into steaks on the boat. Now that I live in Chicago, it's a different story. The only readily accessible and budget-friendly fish here is tilapia - which is delicious, but has a very plain flavor. I have another packet of the spices, and I think next time I will go to Whole Foods and splurge on a good piece of salmon or something that would better compliment the flavor of the marinade. The lentils, on the other hand, were delicious, and I may have found a new favorite side dish. They're easy to make, have tons of fiber, and they're totally tasty! I want to look for more recipes that feature them - I can see doing them with tomatoes or something else acidic and wonderful. ONE thing that you can improve upon for the following week: Staying positive. I love seeing the numbers on the scale drop, and I can feel the changes in and on my body, but I still avoid looking at my shadows or looking in mirrors. Physically, I feel gorgeous, but seeing how much work I still have to do gets me down. I know it's totally the wrong way to be looking at this, but it's an old habit that's dying awfully hard. So for this week, I want to start falling in love with the girl in the mirror as she melts away! Congrats on crossing that finish line!! :) I know that is such an awesome feeling!